Cafe insurance protects your business against financial losses in case of an accident or even if your cafe is forced to close. 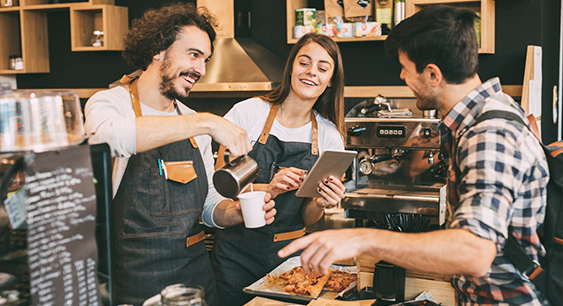 Whether you own a cafe, coffee shop or bistro, you’ll need commercial insurance in place to protect your company against risks and claims. Do I need cafe insurance? As a cafe owner, you’re responsible for the safety and service of every customer that visits your premises. So, if they were to become ill or injured due to the negligence of your business, you would be held liable. In this case, your insurance would cover any compensation costs or legal fees related to the claim. Which type of coffee shop insurance do I need? Business tools and equipment insurance: Covers the replacement of equipment such as coffee machines or dishwashers, if they were damaged, lost or stolen. Where you cafe is located: Insurers will use a postcode rating to assess the risk of threats such as theft, flooding and subsidence. The levels of coveryou take out: The more you take out and invest in the safety of your business, the more it’ll be protected. The size of your cafe: A bigger business means more stock, staff, and contents, which means more potential risks and higher insurance claims. Additional policy extensions can be added, if you need protection that is more specific to your business’s needs.